Embedded systems became ubiquitous decades ago and are now found in everything from mobile devices to vehicles to the traffic lights that control their movements. These days, they're typically based on microcontrollers and perform some specific task(s) within a larger system, such as controlling your car's ABS system. They may or may not have any sort of user interface, and can range widely in terms of complexity and functionality. In an earlier post, we surveyed the basic properties of PAM4 signals. Now, we will examine some of the ways in which PAM4 is finding application in the real world and what test and measurement setups might look like for those applications. As our society's hunger for data grows—not only more data, but more data delivered faster—older modulation schemes based on NRZ-type encoding grow increasingly inadequate. We need to get data from point A to point B as efficiently as possible, whether that means between chips on a PC board or from one end of a long-haul optical fiber to the other. A modulation scheme that's gaining favor in many quarters is PAM4, and in this post we'll look at the basics of PAM4 before turning to the test and analysis challenges it poses. is prevented from triggering on the normal signal shape. different by at least 15 μs from the typical 325 μs. Any piano player is well acquainted with the right-most pedal on their pianos, known as the sustain or open pedal. Pressing that pedal while playing will lift all of the instrument's dampers away from the strings, allowing them to ring freely until their vibration dies out or the pedal is released. On a digital oscilloscope, the persistence display mode is a little like the sustain pedal on a piano. 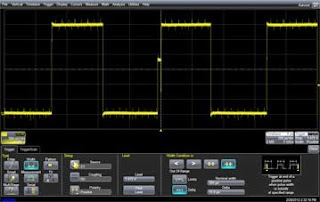 When persistence display is selected, the oscilloscope will trigger, display the signal trace, then trigger again and add another trace to the display, and so on.